It’s hard to find professionals these days who really care about the work they do and make it their mission to provide the best quality and service every time they answer a call. When you find a pro like this in any line of work, it’s a good idea to stick with them, so you can have something to count on in an uncertain world. That thinking certainly applies to the world of commercial heating and cooling, where HVAC installation, HVAC maintenance, and heating and cooling repair work can be essential to keeping your business operation running smoothly and comfortably. For sure there are a number of good heating and cooling contractors in the region around Bremerton, Gig Harbor, and Port Orchard, Washington. When you’d like to have full confidence that all your heating and cooling requirements are being handled by a professional who cares about his work, you should contact Burdick Heating, of Bremerton, WA. For more than 30 years now, the dedicated professionals at Burdick Heating have been impressing business owners and homeowners alike with their work ethic, their attention to detail, and their commitment to getting the job done right the first time. Heat pump installation, repair, and service – Heat pumps provide one of the most versatile ways to do both heating and cooling, all from a single HVAC unit which operates with the kind of energy efficiency that saves you money on those monthly utility bills. We can install a brand new heat pump for your business, or perform repairs and service an existing system you have installed. Furnace installation, repair, and service – If your furnace is 10 years old or more, you may want to consider having Burdick Heating install a modern energy-efficient furnace for you. We’re also happy to do any repair work on your existing furnace, and do regular maintenance as needed, to keep the system running at peak performance. Air conditioner installation, repair, and service – From the smallest retail store to the biggest warehouse building, keeping cool is very important to occupants and contents of your facility. Let us size your facility for a new air conditioner installation, or do professional service on the system you currently have. Ductless HVAC installation – Going ductless can avoid a lot of energy loss from leakage from a blockage in the ducts themselves, and it takes up less room than a network of HVAC ducts. We can install a ductless HVAC system for you so that you can realize all the benefits it provides. 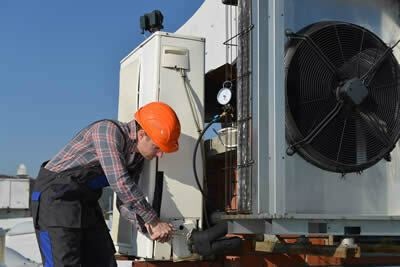 Scheduled HVAC maintenance – The best way to avoid costly major repairs and breakdowns of your commercial heating and cooling system serviced on a regular basis, so potential problems can be spotted before they happen, and so the life of your HVAC units can be extended. To discuss any of the services mentioned above, or for any inquiries you may have, call us at Burdick Heating, at your earliest convenience. You’ll like the professionalism we bring to the job, as well as our determination to deliver the best customer service of any HVAC contractor in the region.